What does a timing belt do in a car? In an engine, the opening and closing of the valves must be precisely timed with the up and down movement of the pistons. The valves are operated by the camshaft(s). 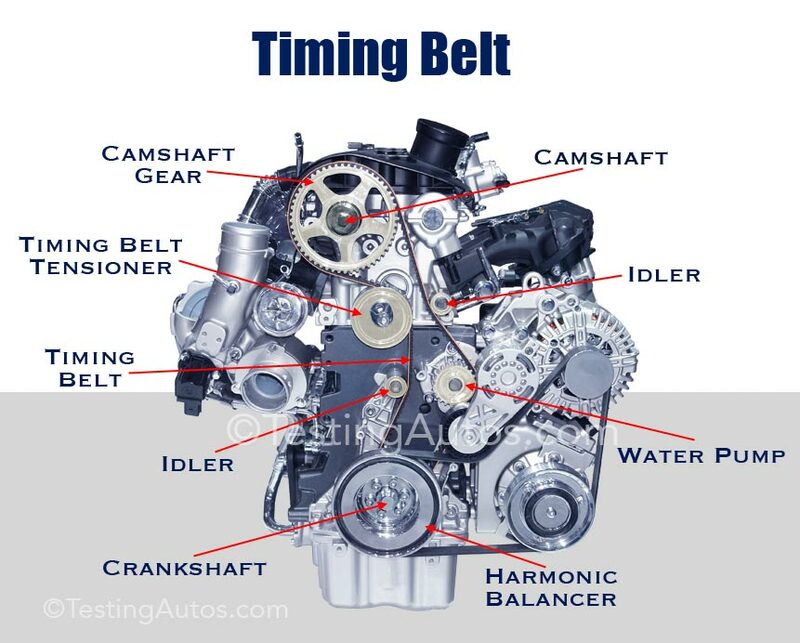 The job of a timing belt is to synchronize the rotation of the engine crankshaft with the camshaft(s). 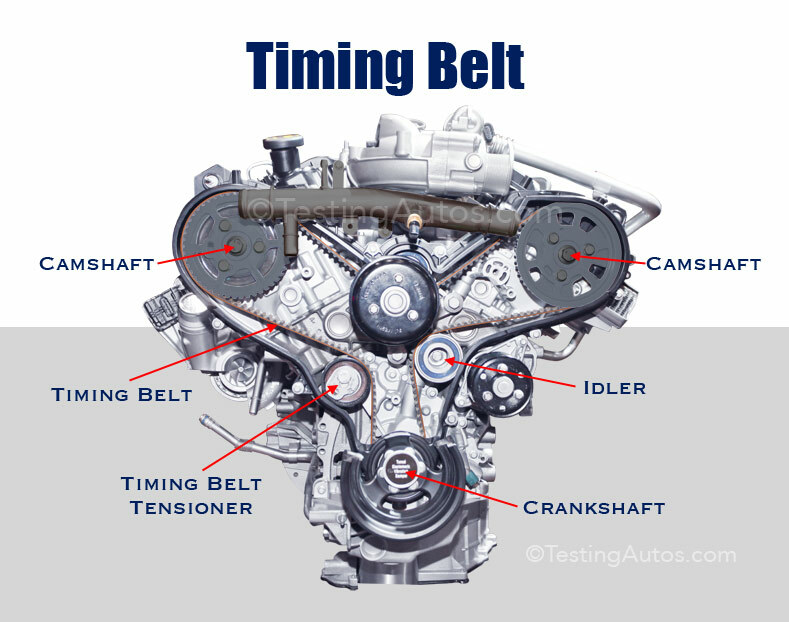 Timing belt synchronizes the rotation of the crankshaft and camshaft. More illustrations: Fig 1. Fig 2. Fig 3. 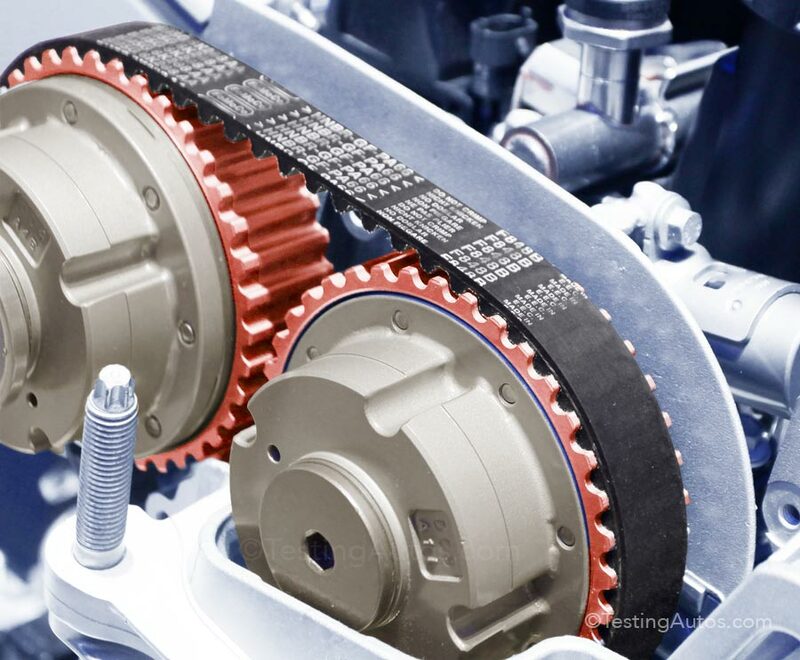 Unlike the drive belt, the timing belt is a toothed belt running on gears. It's made of a durable material, but over time it wears out. Do all cars have a timing belt? No, many modern cars have a timing chain instead. A timing chain rarely needs replacement. 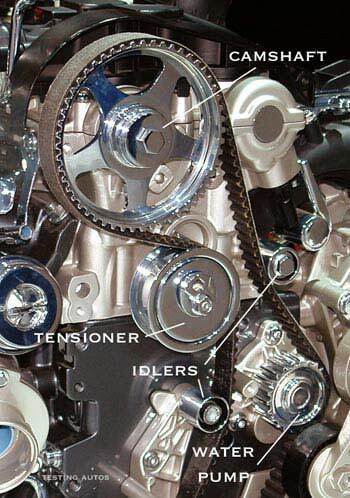 Read more: When does the timing chain need to be replaced? How to know if a car has a timing chain or timing belt? You can check the maintenance schedule or call your dealership service or parts department. They might ask you for the engine size or the VIN number, as often the same car comes with different engines. Another option is to ask your mechanic during your next oil change. Toyota published the list of models that have a timing belt online: Does my vehicle have a timing belt or timing chain?. How often should a timing belt be replaced? Timing belt recommended replacement intervals vary from 60,000 to 106,000 miles. You can find the recommended interval in the maintenance schedule, which is usually included in the owner's manual or a separate brochure. For example, we checked the maintenance schedule for the 2017 Chevrolet Sonic. For the 1.8L engine, It recommends replacing the timing belt, idler pulley, and timing belt tensioner every 97,500 miles. We posted several links where you can check the maintenance schedule online at the bottom of this post. Can a timing belt last past the recommended interval? Yes, in some cases. We came across a number of high-mileage cars with a timing belt that has never been changed. In fact, as we worked on this article, we discussed the Toyota Highlander belonging to one of our colleagues. It had almost 200K miles and the timing belt has never been changed. The owner said that he checked the belt recently and it still looks OK.
On the other hand, there are cases when a timing belt breaks at a lower mileage than the recommended interval. Premature timing belt failures are often caused by faulty timing belt hardware (tensioner and idlers), leaking water pump, improper tension and oil leaks. Can a timing belt condition be inspected? Yes, although a timing belt is hidden under plastic or metal covers. This timing belt is still in good shape. Acura TL. Your mechanic can remove one of the covers and visually assess the timing belt condition. For example, this timing belt in the photo belongs to the Acura TL with 52,000 miles. The owner wanted to check the timing belt condition before going on a long road trip. This belt appears to be in a good shape and should last a while longer. 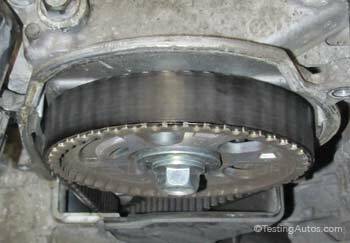 The timing belt in the next photo belongs to an older Honda Civic and it looks worn out. The owner rightfully decided to have it replaced. 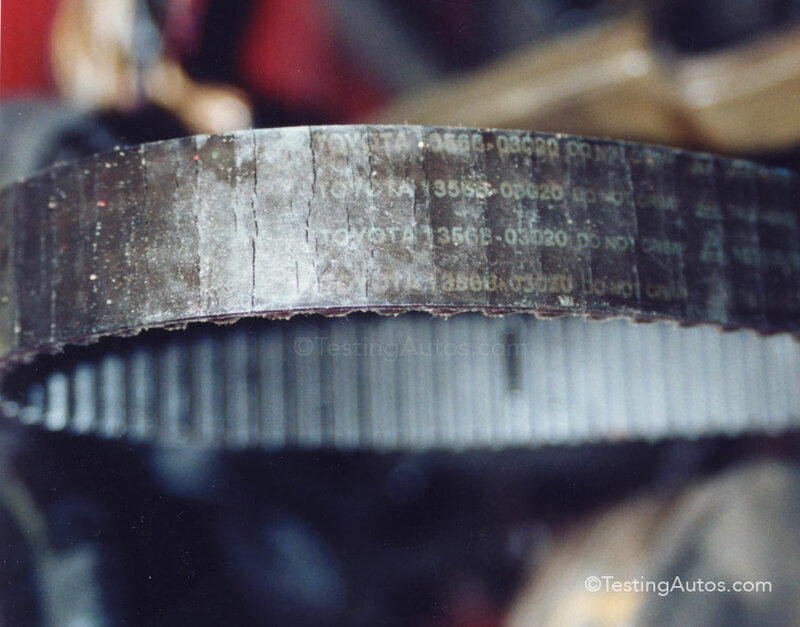 See another example of a worn-out timing belt. What happens if a timing belt breaks? There are two types of engines: an interference and non-interference. In an interference engine, if a timing belt breaks while driving, there is a good chance that the engine might be severely damaged. A non-interference engine will stall if a timing belt breaks, but further damage might be limited. The difference is that in an interference engine, valves that are fully open will be hit by the pistons in the top position. In a non-interference engine, there is still some clearance between fully open valves and pistons in the top position. How to know if your engine is an interference engine? Here is the link to Timing Belt Replacement Interval Guide, courtesy of the Gates corporation. In this guide, the interference engines are marked with the star sign. Another reason to replace an old timing belt is that over time it stretches. As a result, the engine timing might become too retarded (delayed). Symptoms of a retarded engine timing include lack of power and slow pick-up. In some cars, a stretched timing belt can also produce a dull rattling noise coming from the timing belt area. Usually the noise is noticeable at idle, but disappears when the engine is revved. How much does the timing belt replacement cost? It depends on the engine. Timing belt replacement in a 4-cylinder engine may cost from $250 to $600, plus a little extra if you want to replace the water pump and other hardware. In a V6 or V8 engine, the timing belt replacement cost can run from $380 to $780. Is it necessary to replace a water pump, as well as timing belt tensioner and other hardware along with the belt? It's not necessary, however, it's usually recommended, because a very little extra labor is involved in replacement of additional parts. A water pump does wear over time, so it might make sense to replace it together with the belt. Is it difficult to replace a timing belt as a DIY project? If you have the tools and the skills, it's not that difficult. In a small 4-cylinder engine, for example, in an older Honda Civic, it can be done within two hours. The hard part is usually to remove the harmonic balancer (main engine pulley) as the bolt holding it is very tight and sometimes you might need a special puller to take the pulley out. 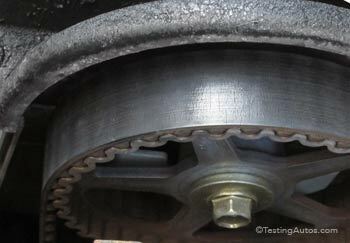 Another difficult task is to set the timing properly and adjust the belt tension when the new belt is installed. For this you might need the factory service manual.